I didn't intend to make this review. In fact I had decided not to before I even got my hand on these units. Innokin contacted me some time ago to ask if I would be willing to work with them on making a quick start guide for the Endura. I really liked the idea, and I asked that they would donate my payment for the job directly to the Norwegian vaping advocacy group NDS. A generous donation has been confirmed. I have not made any money on this personally. Well, I got a pack of these Enduras in last week and these things are the perfect gateway to stop smoking. I weighed it back and forth a bit and decided that I wanted to review these in my usual style to make it as accessible for new vapers as possible. So, your review was super helpful to me. A friend handed down the T18 tank to me and I knew nothing about it except that it needs to be cleaned. While researching I come across your page. I am a former smoker of 20 years. I had to quit smoking after i got real sick and now have asthma. It was sooo hard for me to stop the smoking even while not being able to breath and in and out of the E.R. and doctors office every other dang day. 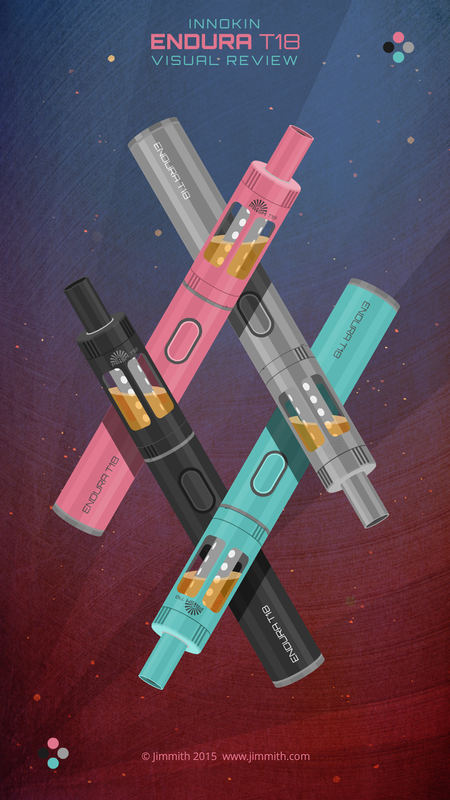 I came across vaping and found that I liked it it and it wasn't hard on my lungs and i could lower my nicoten intake and it is becoming a hobby as well. 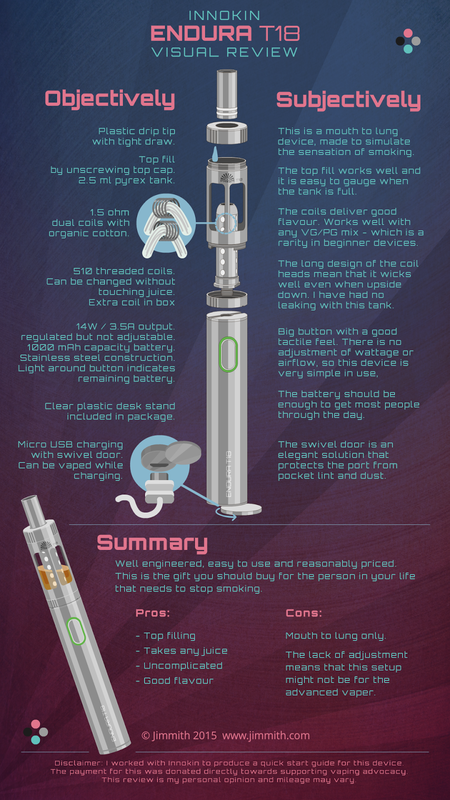 I've only bought 3 low level pen sets and would love to dive further into this and let others know and educate others about vaping and the benafits of being a vaper. I live in Toledo Oregon and vaping is not super popular here. It is starting to pick up due to the new legalization of pot and people using vaping stuff for the exstract cartridges. How can I become a tester for companies and review their products like you? I am a stay at home mom and home maker and have the time on my hands to do this and would really appriciate your help and advise in becomimg a tester/reviewer. Thanks for taking the time to read my rambling and sure hope you can help a girl out. Informing others is exactly the reason I started doing this myself. I felt that there was a lot of technical information, and a lack of simple user friendly reviews out there. As for how to get into reviewing for yourself there is no "official" way of doing it. I would advise that you think up a way to make your reviews stand out in the crowd - Find out what or how you want to tell people that is not already out there. Make a review or three from what you have or can borrow and see how people receive it. Make sure to tag the companies involved so they see your postings. Personally I just wanted to see if I could draw how something tasted, and it sort of snowballed from there.